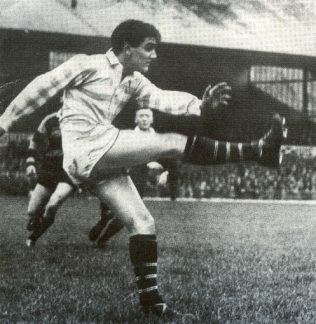 Tony Lewis made his debut at full back for Gloucester at the end of the 1957-58 season and played regularly in 1958-59 while stationed at RAF Innsworth on National Service. He then went up to university at Cambridge where he won a rugby blue the following season. Better known as a cricketer, he won cricket blues in 1960-61-62 and captained CambridgeUniversity, Glamorgan and England. Anthony Robert “Tony” Lewis CBE was born in Neath on July 6, 1938. He was educated at Neath Grammar School. He was an accomplished schoolboy rugby footballer and cricketer and an equally accomplished violinist. At the tender age of seventeen he had to choose between playing CountyChampionship cricket for Glamorgan in the last two games of the season and playing for the National Youth Orchestra of Wales. He chose cricket. After gaining his rugby blue in his first year at Cambridge, Lewis concentrated on cricket, captaining Cambridge and scoring over 2,000 runs for Cambridge and Glamorgan in 1962. He captained Glamorgan from 1967-72 and captained England in eight Tests. He was chairman of Glamorgan from 1988 to 1993. In 1974, on his retirement from CountyCricket, Tony Lewis became rugby and cricket correspondent of the Sunday Telegraph. He was invited to anchor a new BBC radio sports programme “Sport on Four” which he did for ten years, being succeeded by Cliff Morgan. He also presented BBC TV’s Test Match cricket coverage for many years. He was President of the MCC from 1998 to 2000. He chaired the Welsh Tourist Board and also chaired Celtic Manor’s successful bid to hold the Ryder Cup in 2010. Tony Lewis was awarded the CBE in 2002.